Orange is the New Black. Sounds like a much hyped statement...right? Yes apart from the famous American Drama Series, Orange has literally hit the favorite lists of many. Mine too. To me, it is such a happy colour that it can really uplift your mood, bring that healthy charm and glow to you and your persona. I think the details of this Skirt is a shout-out again to my Love for Felines, as I mentioned in my previous post (read here). I paired this bold detailed Pencil Skirt with this simple and gorgeous Orange Peplum Top. 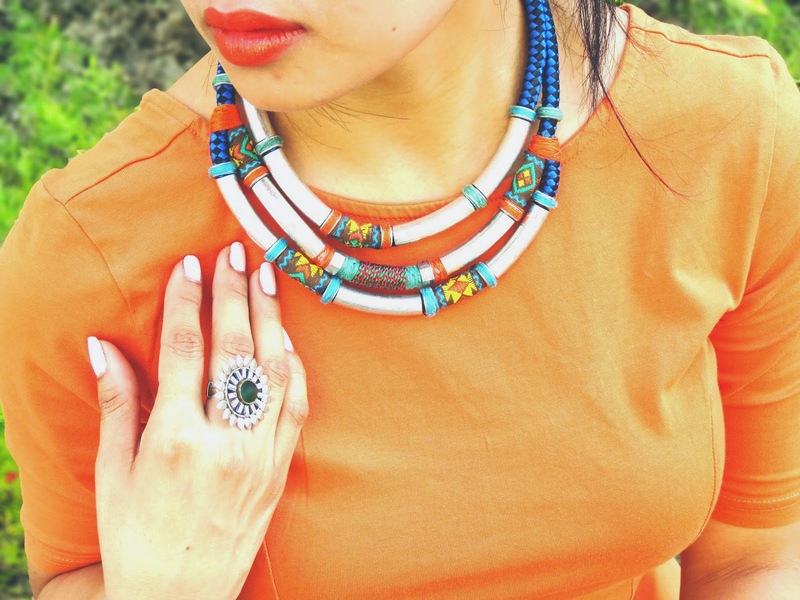 Also incorporated an Aztec Print inspired necklace to go with the skirt's details. A thin Belt to accentuate my waist, and rest of the accessories in Brown Neutrals so that this overall bold outfit stands out bright.